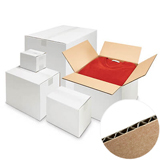 Buying custom printed boxes doesn’t get any easier than this! Our brown double wall custom printed boxes promote your business and give you the kind of reliable strength you need. They’ve been made from tough BC flute board and are capable of holding up to 30kg in weight. And now we’ve just made it a lot easier for you to find out how affordable they can be! From the drop down list below, select how many colours you’d want, then see the cost for some of our best selling double wall boxes. Costs are based on examples shown for 1, 2 and 3 colour print. (A one off stereo cost may also apply to first orders). 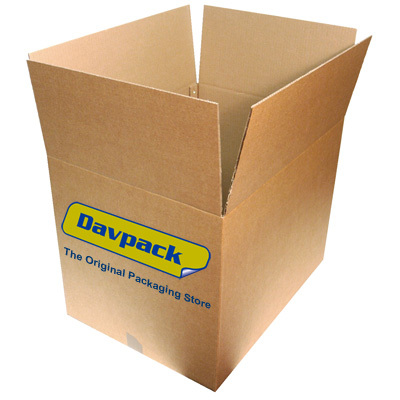 But don’t worry if you can’t see the exact size that you want - fill in our online form, email us at sales@davpack.co.uk or call us today on 01332 821200, and we’ll get back with a precise quote for your printed double wall boxes in double quick time. Once you’ve placed your order, we’ll give you a call to sort out getting your artwork, then you can expect delivery in just 7-10 working days – it really is as simple as that! Many more sizes available – call us for a quote!